There seems to be some improvements to Maya's itchiness after starting her on valerian root lately. At least we were able to go out for walks without the cone. For a few days, I tried "wrapping her up" as it's proven to help with anxieties. 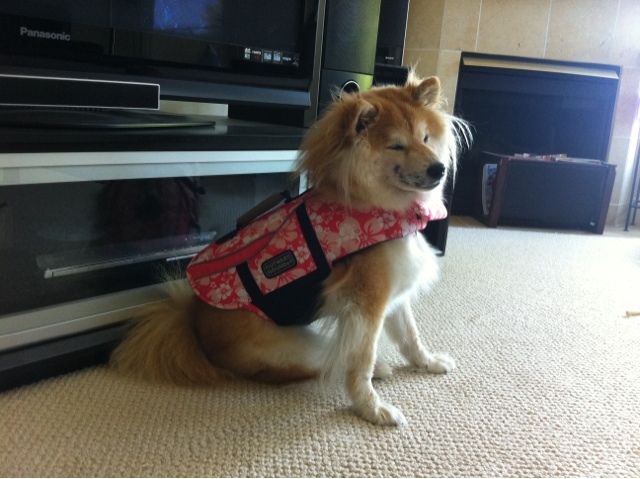 I started with her life jacket since it's already available. Well, it did stop her from scratching, but it also stopped her from doing anything. Poor girl woke me up in the middle of the night crying, because she wasn't able to get up on her own when she laid down. I tried ignoring her and let her learn how to get up, but it went on for quite a while, so I guess the life jacket really is too bulky. 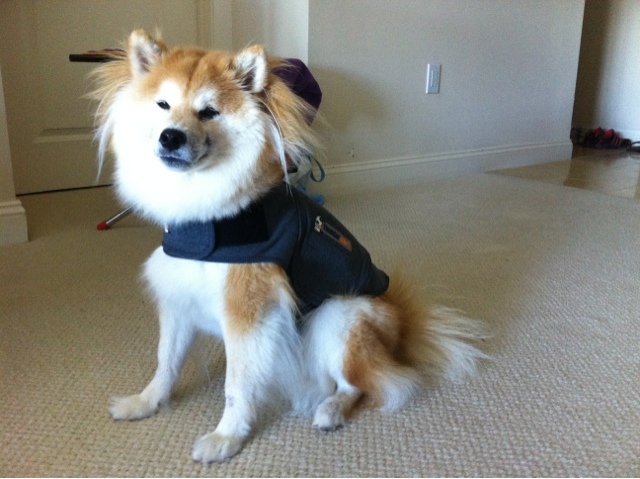 We ended up getting a real Thundershirt to try on. For the first few hours, she sat there frozen again, but as she got more confortable, she started to chew on her feet and eventually scratch her face. She also seemed more anxious in the Thundershirt, as she would just stand there and start panting excessively. Oh well, at least it has a money-back guarantee. I've switched back to feeding her THK Verve in the past week or so, because the valerian root tastes really bad and she would pick out all the meat pieces when I mix it with her meals. THK's powdery form makes it easier to mix together with the supplements. I also started to add in beef liver and will work up to the amount suggested by the doctor (2 oz. per day), if there's no bad poop reactions. It's a bit alarming that she's been gaining weight. She put on a whole pound in the past two months, which is equivalent to about 5 to 8 pounds for humans. It's not that surprising because we've been cutting her walks short due to the "cone attacks" and she's been spending most of the day sleeping. Since she's doing better outdoors now, we started to lengthen her walks and take her out on late night jogs. She seems a lot more active in the late night breeze, and even better, the humans dropped some weight as well! Her poofy-ness makes the Thunder Shirt look EXTRA snug on her. I know I shouldn't chuckle but... Oh, Maya. I sometimes take Valerian Root for sleepless, anxiety-filled nights (a constant battle). It does have a distinctive, earthy scent that I imagine can be quite off-putting to a dog who is a million times more sensitive to smells!